Our guiding principles are second nature to our attorneys, but we believe it is important to share our philosophy and the way we conduct business. Our clients absolutely come first; we are in business to serve them. We believe that professionalism and integrity are essential in serving clients and their best interests. Our firm intentionally maintains a small size to keep the focus on personal service and close relationships. We zealously represent our clients in an ethical and cost-effective manner within the bounds of the legal system. Offering our time and energy to professional and civic organizations has become a cornerstone of our firm and a way of saying thanks to the community. A few of these organizations are the Leukemia & Lymphoma Society, Kansas State University, Wichita Art Museum, Boy Scouts of America, Downtown Y’s Men’s Club, Wichita Crime Commission, Ahavat Achim-Hebrew Congregation, Life Care Center of Andover, Catholic Charities, Knights of Columbus, American Heart Association, ALS Association, Kansas Independent Oil & Gas Association, and Leadership Wichita. Depew Gillen Rathbun & McInteer, LC, was a finalist for the 2009 Small Business Award given annually by the Wichita Area Chamber of Commerce. Depew Gillen Rathbun & McInteer, LC, began in Medicine Lodge, Kansas, where Chester I. Long, former U.S. Diplomat, Kansas Senator and former President of the American Bar Association, established the firm in 1885. 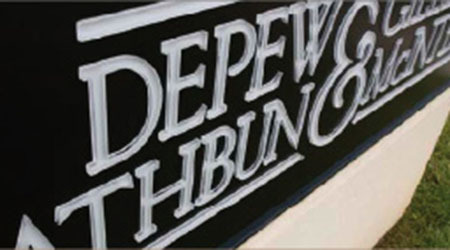 Mr. Long moved the firm to Wichita in 1911, where Claude Depew, father of Spencer L. Depew, worked as Mr. Long’s legal secretary while “reading to the law” (becoming an attorney on the job before the universal acceptance of law schools). Once he passed the bar exam, Claude Depew joined Mr. Long’s practice as an attorney. Spencer L. Depew joined the firm in 1960 and Dennis L. Gillen in 1972. Spencer Depew and Dennis L Gillen began a small practice in 1979 under the name Depew and Gillen, specifically to provide a high level of client service. Spencer, who died in 2005, specialized in energy and estate law, and Dennis specialized in litigation. Randall K. Rathbun became a member at Depew and Gillen in 1981 with a passion for trial work and a dedication to environmental law. Randy has earned a national reputation as an environmental advocate. Jack Scott McInteer joined the firm in 1972 before leaving in 1981 to serve as President of Ryan International Airlines Inc. Jack negotiated the sale of Ryan International Airlines in 1990 and rejoined the firm with an emphasis in aviation and business. Depew Gillen Rathbun & McInteer LC was born. Charles (Chris) C. Steincamp joined the firm in 1993. As an attorney and licensed geologist, he works in energy, environmental, regulatory and real estate areas. Chris is also the managing member. Kimberly A. Vining became an associate in 2005 after clerking with the firm. She became a partner in 2010. Kim practices estate law and probate, civil litigation and business law. Joseph A. Schremmer clerked with the firm during law school and was added to the attorney team in 2015. He became a partner in 2017. Joe focuses on oil, gas, and mineral law, as well as environmental, real estate, and business and corporate law. Benjamin K. Carmichael also joined us in 2016. Ben practices in general civil litigation with an emphasis on employment, environmental, and oil and gas disputes. The firm is on a path of slow, controlled growth, adding only proven attorneys with established reputations and skills, as well as young attorneys with extraordinary credentials. While maintaining our small size is important, we are always searching for outstanding talent. Whether a proven attorney with an established reputation, a young attorney searching for a firm to join, or a law student looking for a clerkship, we would like to hear from you. Please contact Chris Steincamp to further inquire about career opportunities.